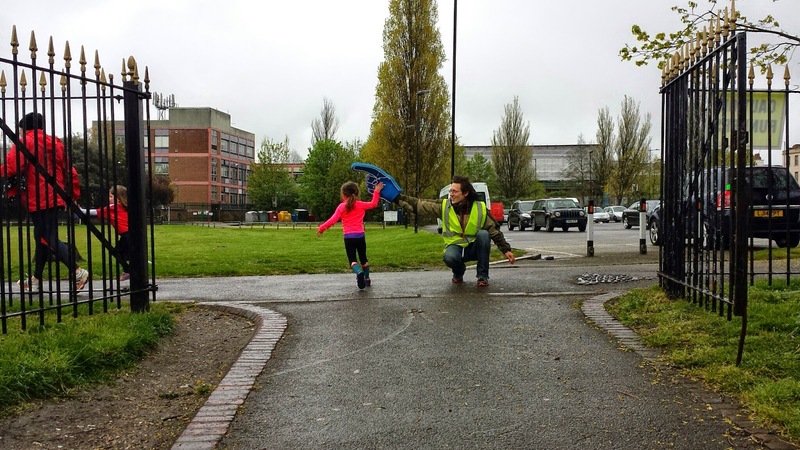 If life had taken the path that I had imagined it would, I would have been running the 2015 London Marathon and Matilda would have been in Central London with her Mum and the rest of my family getting ready for a brief encounter with me as I trudged out my final mile or so. But as things panned out, this year was not to be and I withdrew my place. With the marathon no longer an option I wanted to do something else and what better than helping the next generation of (marathon) runners. 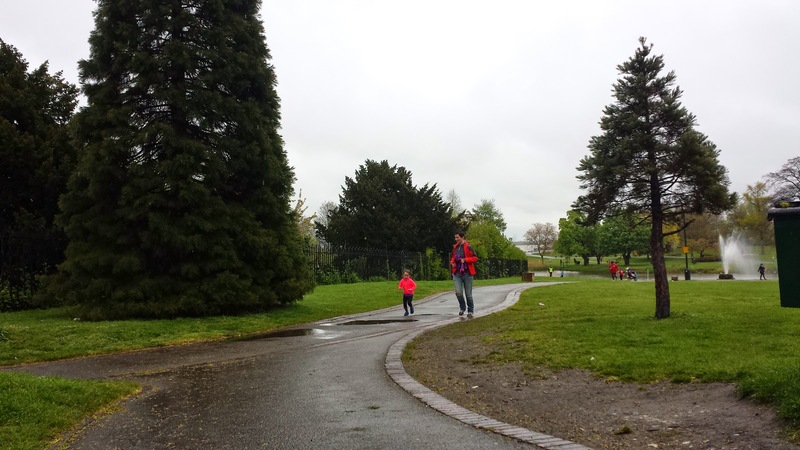 So I put my name down as a volunteer at Gravesend junior parkrun and we headed over there for a pretty special event. You see, a few weeks beforehand Matilda had run at the inaugural Lesnes Abbey Woods junior parkrun and in the process she had achieved her first junior parkrun landmark run by running 11 times becoming part of the junior Half Marathon club (11 x 2 being 22km - ie hitting and then passing the half-marathon mark). 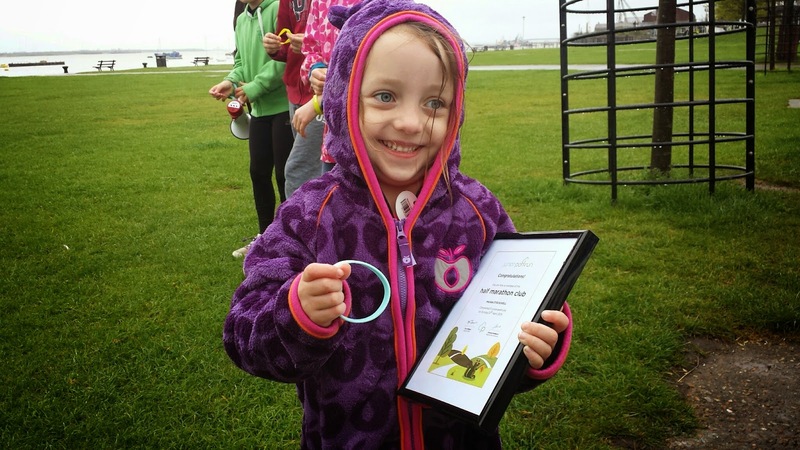 She knew that she would receive a wristband as recognition of her achievement so she was pretty excited and was keen to go even though it was a miserable, rainy morning. By the way, when a junior runner reaches a landmark run a link appears on their personal club progress page and this gives the runner a printable certificate. I hadn't told Matilda about the certificate but I had printed one out and framed it. Once arriving at the Gravesend Riverside Gardens I headed over to GjpHQ in order to hand over the certificate so it could be included with her presentation. Once that was sorted I got kitted out in the hi-vis volunteer jacket and grabbed myself one of the legendary junior parkrun foam hands (I picked blue to match the half-marathon wristband). 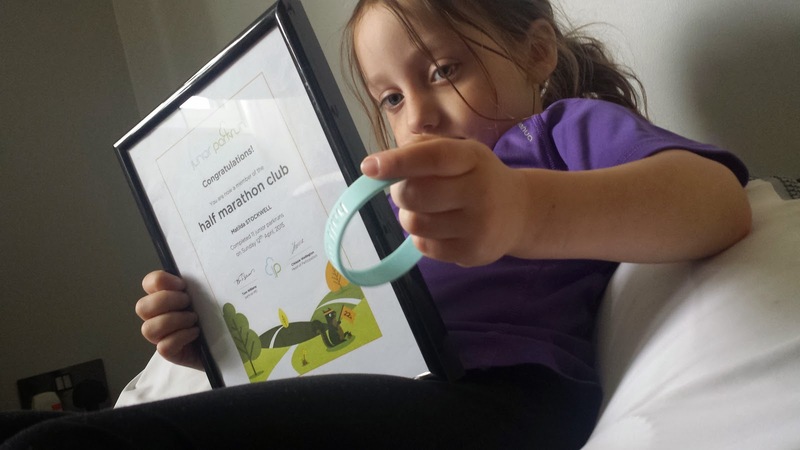 Just before the warm-up the wristband presentations took place and Matilda was over the moon to receive her blue half-marathon wristband and certificate. As soon as that was complete I took a swift jog over to the opposite side of the park to take up my position at the car park gate marshalling spot. Matilda had decided that she wanted her Mum to run around with her today. After about 16 minutes of pointing, hi-fiving and cheering, the last of the runners and the tail runner came past and it was time to collect some signs and head back to HQ. It's actually quite interesting seeing the responses I got when I offered hi-fives - the younger ones loved it, but in general the older ones were not so keen. Once the results had been processed Matilda's results text message came through to my phone and she was really happy when I told her that she had run a new personal best. Her best 2k time is now 15.21; this is exactly one minute faster than her previous best on the course. So although it wasn't the day I had initially had in mind for 26 April 2015, it certainly turned out to be pretty good.